Timothy King and Ricky Valero were back with another edition of the Fantasy Forecaster. In this weeks show they covered everything from the surging Royals offense to Jonathan Lucroy to Matt Kemp and so much more. Or head over to iTunes and subscribe today! We are here each and every Wednesday starting at 9:00 PM EST. If you have any questions for the guys on the show and want your questions answer live on-air, don’t hesitate to send them a shout! RIGHT NOW IF YOU JOIN FanDuel.com and make your 1st deposit using the Promo Code – SCRIPT – You will get 100% bonus match on it!!!!!!!! Just do it folks. Yesterday was a throw away day in daily baseball. Small slates can be annoying. 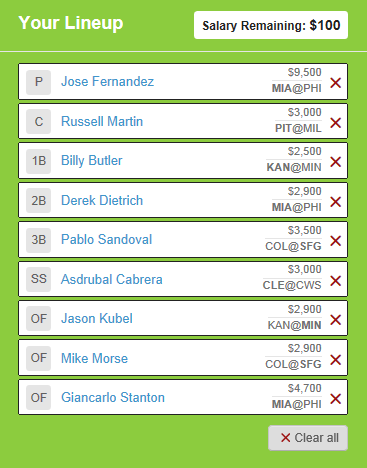 This my lineup if you go top flight priced pitching in Fernandez. Here are a few reason’s I picked these guys. Jose Fernandez vs. Phillies – The Phillies have been terrible on offense and Fernandez has been lights out. Easy decision. This lineup is for if you want to stay on the cheap end of pitching and try to load up on batters. Another Lineup I am throwing out today. The MLB season is upon us which means it is time for the Fantasy Baseball season. We here at the Sports Script want to do everything possible in setting you up for draft day and helping you throughout the season to win a Fantasy Baseball Championship. We are gathering a team of Sports Script writers as well as some special guest to answer 5 key questions about each position for the upcoming 2014 Fantasy Baseball Season. Today we have gathered me (Ricky Valero), Matt Wincherauk, Matt Bell and special guest Ricky Sanders (@RsandersFR) from Fakeroundball.com ( @FakeRoundball) as we are going to take a look at the 1st base. 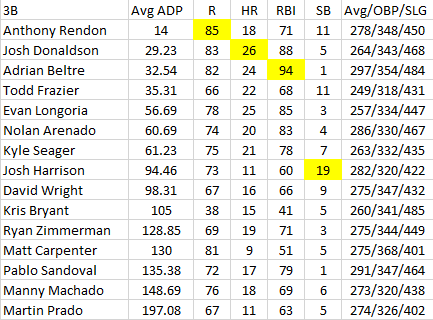 R. Sanders – Early in the draft, I love Cabrera and Goldschmidt, but think Encarnacion comes at a much better value with an ADP of 14 picks later. 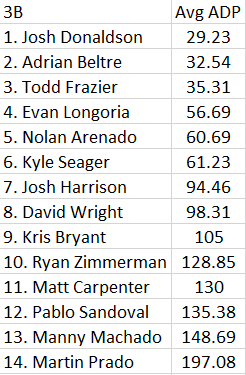 I rank Encarnacion in my top 8 overall. 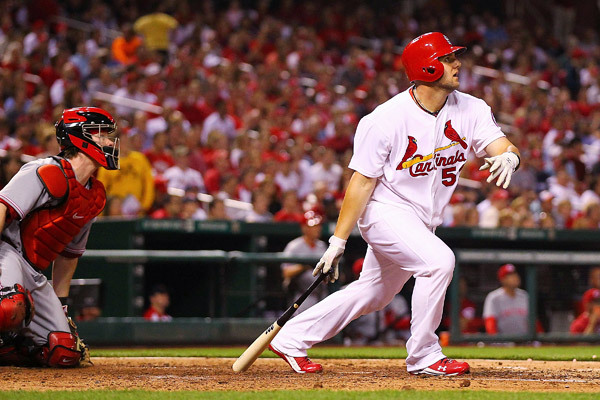 However, the player I’m targeting the most at the first base position is Matt Adams. With a full-time gig locked up, I expect huge numbers in his second season. Others I like at their ADP: Adrian Gonzalez, Mark Trumbo, Jose Abreu and Napoli. Ricky – Of course if you have the likes of Paul Goldschmidt (my 3rd overall player) or Chris Davis, you’d be set at the position. But one guy I am targeting is Prince Fielder. He moves to hitter friendly park in Texas and he will have Beltre hitting behind him as well. Fielder will have a monster season. Matt Wincherauk – I want Prince Fielder. The power hitting big man should benefit greatly from moving to Arlington, a place that he probably should’ve gone to in the first place. The Rangers offense looks to poised to rip through the entire AL and Prince will be one of the big catalysts. Matt Bell – I think you have to say everyone is going to be looking at Paul Goldschmidt as their top 1B this year in fantasy, but for me if I can’t snag him early it’s going to be Prince Fielder. I think his value has dropped a little after a down year for him. He’s going to be playing in Arlington now and that is a hitter’s park, so I expect his homerun numbers to go up this year. 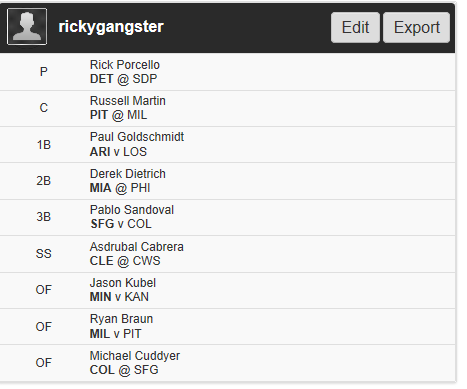 If I can get Fielder a couple of rounds after Goldy goes I’ll be a very happy fantasy player. R. Sanders – Pujols’ bad foot has me worried about his prospects once again this season. He’s no longer the .300/30/100 guarantee he was at the beginning of his career. I’d rather take Allen Craig and Adrian Gonzalez who are going later. Ricky – Joey Votto – While the runs and hits were nice he had a huge dip in his ISO, BABIP, OBP and SLG which all are cause for concern. While he has potential to be a solid Fantasy contributor I for one am staying away this season. Matt Wincherauk – Adrian Gonzalez is who I’m going to be avoiding for the most part. He’s experienced big time drop offs in his power in the past few years, ironically ever since he left Petco Park and went to Fenway. He’ll give a good average, but I want more out of a higher pick. Matt Bell – I don’t care where the value is in Albert Pujols, but I’m staying as far away from him as possibly this year. He’s been awful for the most part since leaving St. Louis and I’m just not willing to take a chance on him this year. He’s going to have to stay healthy before I’ll consider him in future fantasy drafts. R. Sanders – The biggest sleeper, like I mentioned in the opening, is Matt Adams. If you already drafted Adams and wanted another shot in the dark, I’d recommend Brandon Belt. This year, he should surpass his career high 509 AB from last year which could result in a .285+ BA/20+ HR/10+ STL type season. His current ADP is 137. Ricky – Jose Abreu – While a ton of people won’t know who he is entering draft day, they really should. This guy can hit the ball and will do so this season. During the 2010-11 Cuban National Series He hit .453 with 79 runs, 93 RBI and 33 home runs in only 66 games. I like him to have a 20-25 HR season and finish among the top 1st baseman in 2014. 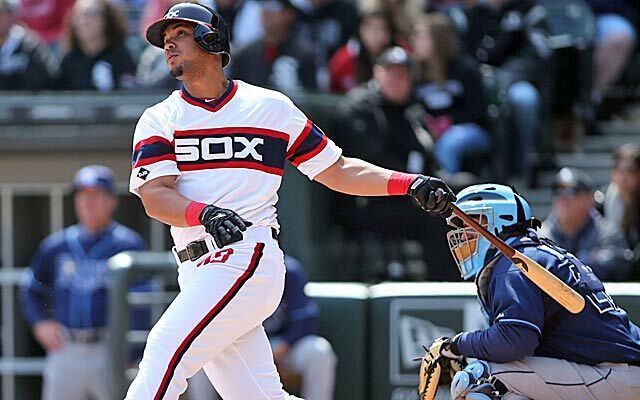 Matt Wincherauk – Jose Abreu is a popular choice, and for good reason. He may be unproven, but he’s got all the tools that made a guy like Yasiel Puig a megastar in an instant. Matt Bell – The biggest sleeper this year is going to be Matt Adams as we saw some small flashes of what he could do last year when given playing time. The Cardinals have made room for him to be an everyday player now which makes him someone I will be very high on this year at the 1B position. R Sanders – Besides Pujols, I think taking Chris Davis inside the top 10 could result in a big fantasy bust. 53 HR could very easily end up being a career high for Davis. I don’t like taking a player who most likely won’t produce élite batting average, steals or runs scored numbers that early. If his HR/RBI numbers drop to around 35/100, he wasn’t worth the price. I feel more comfortable taking him in the second round. Ricky – Chris Davis – People will draft him off what he did last year and rightfully so but I think he sees a decline in the numbers but still has a solid season. But he just doesn’t match his number to justify a 1st round selection. Matt Wincherauk – Mark Trumbo is my choice here. He’s been on the decline for a few years here in terms of his plate discipline and his average as well. He’s not someone who I’m going to trust, and looks prime to be a bust. Matt Bell – The player I’m fully expecting to be a bust this year will be Chris Davis. He will still have a good year I believe, but nowhere near the type of season he had last year. I’ve saw him going in the 1st round of some mock drafts and he will not live up to that position. I won’t be surprised to see him struggle to hit 40 home runs next year. R Sanders – My bold prediction is for Matt Adams. With a full season of playing time, I think he could go .285, 30, 100 RBI with around 85 runs. I rank him inside my top 10 at first base even though 14 are being drafted before him at the position. Ricky – Albert Pujols will hit 34 HRs this season. I think he still has a few good seasons left in him and coming off an injury/disappointing season, he should bounce back well. Matt Wincherauk – Paul Goldschmidt will lead the NL in both homeruns, and RBIs and will fall short of the triple crown only in the average area. 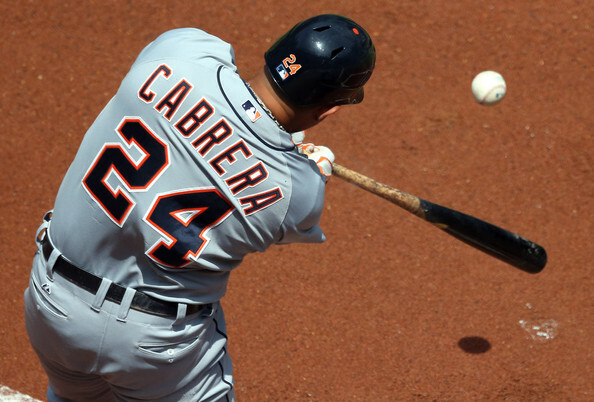 That is arguably the next best all-around hitter besides Miguel Cabrera. Matt Bell – The bold prediction for the 1B position is that Anthony Rizzo will bounce back in a huge way this year hitting over 30 home runs and have an average of around .290 on the year. MLB season is upon us and Fantasy Baseball is back and better than ever! Over the next few weeks we are planning on getting you ready for any of the upcoming Fantasy drafts that you have. This week we are sending out our initial 2014 rankings that we will updated as Spring Training progresses. The week after we are going to answer 5 questions about each position as well as giving you some insight into some players that we like as well. Matt Bell joins me today as we unveil our 1st base rankings as well as take a look at one guy we like higher than his ADP and one we have lower than his ADP. 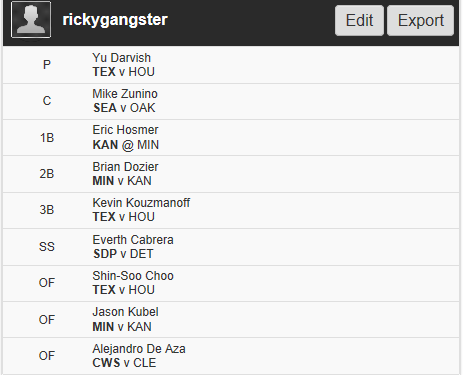 Ricky – Adrian Gonzalez – He has an ADP of 11th overall at 1st base and I have him sitting at #7. Gonzalez has been very consistent fantasy option over the last 3 seasons averaging .310, 190 hits, 22 HRs, 108 RBIs and 84 runs. While he doesn’t show the power he once had, he is in a very potent offense in which he is batting cleanup in and he should easily see his numbers duplicate what they were a year ago. Matt Bell – Allen Craig is a guy I’m higher on that most people as he’s 5th in my ranking while carrying an ADP of 11th among 1B. Craig missed some time due to injury, but if he can stay healthy at his age I think he can carry your fantasy team. He’s hit for an average of .306 in his career and could go over 100 RBI’s this year in the Cardinals Line up. Ricky – Anthony Rizzo – Current ADP is 15th and I have him ranked 17th. It’s really not that much of difference but he has a big upside to him if he lowers his strike outs. I don’t see that happening. In his 1st full season he struck out far too much for my likening and honestly would rather have a guy like Jose Abreu or Brandon Belt who are being drafted 2-3 round later. 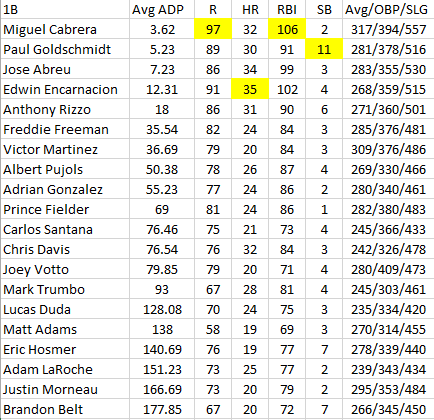 Matt Bell – Albert Pujols has a ADP of place 7 while in my rankings you will find him ranked 16th. I’m not high on Pujols at all this year as he’s battled injuries the last year and is only getting older. I firmly believe there is something wrong with him that will keep him from ever performing at the high levels he use to. Is Albert Pujols going to be a terrible player this year? No, probably not, but he’s going to hit .300 and justify a top 5 round pick in my book. If you have any questions about the upcoming Fantasy Baseball season make sure to hope on over to twitter and ask. You can follow me @rickygangster and Matt Bell @Mattbell211 and we will answer any and all questions.